Barbara, you know I love you like a sister, but you're killing me here! According to Barbara Walters, Sarah Palin’s bus tour of U.S. historic sites is as ethically questionable as Anthony Weiner’s digital indiscretions. 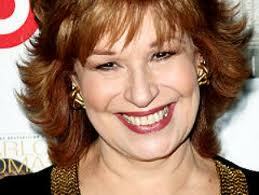 You know it’s bad when Joy Behar feels compelled to defend Palin. Oh, Barbara, how low you’ve fallen. All the “ladies” on the view are actually just shrews spouting vitrolic junk, with the exception of the lovely, Christian wife and mother, Elisabeth Hassleback. Hah! I’ve never watched it, but I always have the feeling I’m not missing anything!